This is Baku, a city of the new century. It was called Black City. I don't know whether or not it had a high meaning or the black smoke of factories was the reason behind the name. But we never gave its name in Azerbaijani. This is "chornigorod" (black city). My parents returned their houses near Neftezavodstroy and received an apartment in a five-story building opposite Shahumyan hospital. We started going to school there. We were three brothers and a sister. Our yard was a large international family. The name of our region was also Armenian – Shahumyan region. Shahumyan bust, Shahumyan Street, Shahumyan underground station. Our neighbors were mostly Armenian and Russian. Each spoke in their own dialect, with their own way of address. My name is Ahmed. The Armenians called me Ahmed jan and the Russians called me Ahmedik. We called them in their language. We added "jan" to the Armenian names and the ending "ik" to the Russian names. If we were addressed with "jan," we knew that the person addressing was Armenian. But we did not understand one thing: "jan" is an Azerbaijani word1. Why did the Armenians appropriate that word? Did they aim to please us? Seeing dark eyes and eyebrows, they asked, "An Armenian? A Turk?" I was surprised. What is a Turk? Are there any Turks living in Azerbaijan? The Turks live in Turkey. This is Azerbaijan, Soviet Azerbaijan. We are Azerbaijanis. They listened to Azerbaijani songs. They raved about Zeynab Khanlarova and Memmedbagir. They even teased us by saying that she is a People's Artist of Armenia, not Azerbaijan, and then sang, "Armenia and Azerbaijan became brothers". Among our neighbors, all masters were Armenians. They had magical hands. The Azerbaijanis called exclusively the Armenians to repair their houses. They registered for several months. The laborers in the oil and gas sector were mostly Russians. There was an Armenian shoemaker among our neighbors. I knew that he admired Anastas Mikoyan. Good footwear was hard to find at stores then. That's why we ordered to make shoes, darned them dozens of times and wore them for 7-8 years. I knew that Mikoyan was the First Secretary of the Azerbaijani Communist Party and Shahumyan's companion-in-arms. He was elected chairman of the USSR Supreme Council under Khrushchev. I had never even seen him, but I had to praise him for the sake of my shoes. I perceived it just as it is said in the proverb: "I call an Armenian my uncle for the sake of benefit". Every time I entered the shoemaker's small workroom, I started praising Anastas Mikoyan. I kept praising him until Karapet said, "I liked it, ara. Take a pair of shoes as a gift, Ahmed jan."
When one of our Russian or Armenian neighbors died, that day became a celebration for the lazy parasite Azerbaijanis. They gathered at the Armenian's doors since morning. They shed tears insincerely. They knew that there would be funeral repast, with vodka as well. The Armenians do not clink glasses during funeral repast. But the Azerbaijanis forgot about it, clinked glasses and drank "to Rubik." Also, there was mister Ibish. He got so drunk at the funeral repast of an Armenian that could hardly stand on his feet. His wife cursed him, "May you rot in hell! When Mammad died, you hardly attended the forty days ceremony. But what now? As soon as Rubik died, you ran to his home. Is this because there was vodka?" Most of the Armenian boys living in our neighborhood went to Russian school, and so did the girls. But one of them, Shushanik, daughter of mister Armen, attended our Azerbaijani school. We were classmates. We went to school and came back home together. She was beautiful. She had black eyes and long hair. Our whole district admired her beauty. I very much liked pronouncing her name. Every time, Shushi revived in my mind. It seemed to me that the name Shushanik was derived from "Shusha". The ending "ik" was just added for euphony, just like I was called Ahmedik. Our roots are in Shushi. But I have never been there. I did not even know where it was. 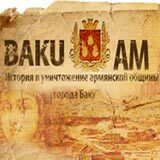 My father and mother were born in Baku. Our descent and roots have never been talked about in our home. But Shushanik's family moved to Baku from Karabakh. Her grandfather and grandmother lived in Hadrut. They went there every summer. When she came back, she told about the beauty of those places. I listened to her stories about Karabakh with interest. With my roots in Shushi, the Armenian's daughter taught me lessons of Karabakh geography. My life was here, in the "chornigorod". It was in the factory smoke, in the hooting of cars transporting oil, in the boulevard and puffs of dust caused by wind in Baku. All that was dearer to me than Karabakh or Shushanik's stories about Karabakh. But I listened anyway. The Armenian boys were keen on making friends with me. I did not know Armenian. But I spoke Russian well. They knew Russian well, too. But at every opportunity they tried to speak Azerbaijani with me. Of course, they spoke broken Azerbaijani…I mocked at them, but also corrected them. Thus, after a while the Armenian boys spoke my native tongue better than me. Then they estranged themselves from me. It was later that I learnt that they needed to learn our spoken language perfectly. My friendship with Shushanik became stronger day by day. Armen ami instructed me to defend his daughter against any offenders at school and outside. We went to school and came back together. Her brother, Arsen, looked at us askew, but said nothing for fear of his father. My parents were not against that friendship as well. To be more exact, they were indifferent to it. We were neighbors, we all lived mixed together. Shushanik was a well educated girl. Although it were the 1980s, she was a broad-minded person. She asked such questions that I stood giving her an empty stare. "Who is the founder of Soviet rule in Azerbaijan, Ahmed?" "Shahumyan. Stepan Shahumyan. Look, our district also bears his name. Also, there is Shahumyan region in Azerbaijan. What is the capital of Nagorno-Karabakh Autonomous Oblast?" "How can't you know? It is Stepanakert. Its name is also in honor of Shahumyan. How many regions are there in NKAO?" "You could at least have named Shushi. I would add Martakert, Stepanakert, Martuni and Hadrut. Who was the first national writer of Azerbaijan?" "It was an Armenian, Alexander Shirvanzade. I have his book Chaos at home, in Azerbaijani. I will give it to you to read. He is our pride. Who is the architect of economic "perestroika?" Also an Armenian, Ahmed jan, also an Armenian. Academician Aghabekyan. The Armenians also saved the Roman Empire from the Spartacus' revolt and devastation. My ancestors also saved Arab Caliphate from Babak. Do you know who Babak is?" "Yes, I have seen the movie". "Why was the Khorram-dinan movement called so? What is "free love?" "You'd better not know it. You are too young. Who is the Catholicos of Armenians?"" "Vazgen, Ahmed jan. Who is your religious leader? Who is your sheikhulislam?" "It's the first time I hear about that". "Do you go to mosque?" – "I go. Every time my mother takes me first to the Armenian church near the Parapet, then to Taza Pir Mosque and after that to the Russian Orthodox church. We light candles in all of them and pray". "I can at least understand when you go to Armenian church. But why do you go to mosque and Russian church?" "There are different places of worship, Ahmed jan, but only one God". "I didn't understand a single word. All this made my head swollen". She tired me with her questions. She was proud when she said in public, "Ermeni, hay". I don't know where she learnt that from. We were not taught that at school and my parents did not talk about it at home. Every time I heard the word "hay," I remembered Hitler. Every time when I heard the phrase "hay Hitler" in a movie, I thought that Hitler perhaps was Armenian. It is good that we studied German at school and I learnt that the word that is pronounced "hay" is spelled "heil". We were graduating from school. We were having a graduation party. We went to the Boulevard to see the sunrise. Hiding from our classmates' eyes, we went up to Kirov Park. Shushanik started asking me questions again. "Have you read Asli and Karam?" "Or Bayandur and Sona by Narimanov?" "No, I haven't read them". "Or Sheikh Sanam by Huseyn Javid?" "How can you ask so many questions? I haven't read them. I don't need that. I will become an oilman like my father. Ask me questions on technical subjects, I will answer". "Oh Ahmed. I am not asking you about Avetik Isahakyan. All my questions are about history and literature of Azerbaijan. All right, do you believe that an Azerbaijani man can love an Armenian woman?" I looked into Shushanik's black eyes. They were burning with fire in the middle of the night. Then I understood why she was asking those questions. First, she wanted to show that she is the daughter of a nation that has a great culture. Second, she wanted to lead up to the story of Bayandur and Sona, Asli and Karam. This was exactly what Shushanik was waiting for. Her lips touched mine. We were burning in fire. At 17, for the first time, I experienced the kiss of a woman. More specifically, I felt it. I was trembling and could hardly contain myself. I was not the kisser. Shushanik was kissing me, pressing herself to my breast. I stood in embarrassment. My faith in love between an Azerbaijani and an Armenian was left behind. I was feeling it now. The feeling of it plunged me into the labyrinth of love. I would either drown there or survive. Tears running from Shushanik's eyes were dripping on my breast. She was purring like a cat. I stopped being myself. I was in Shushanik's world. I had only read in books about such passion and love, confused while reading. I had even learnt by heart the endings of love stories from One Thousand and One Nights. Now, I was the hero of one of the tales. But I was not a Sultan. We both were graduates of a secondary school. In the sin of the "Graduation Party". In the park, on the grass, under a tree. We got beyond the bounds. It was too late, however. To be honest, I was pleased. I loved Shushanik and she knew it now. All right, but how shall I tell my parents about all this? "It is already daylight, Shushanik, let's go". "I don't want. Let's go right now and sign up for a construction team. We will go to BAM and join the builders of Baikal-Amur Railway. We will get an apartment, make a family and have a Komsomol wedding. We will be together, we will be free. We will build our life ourselves." "Let's go home, Shushanik. We will first get school leaving certificate and enter an institute and then we will speak." –"To whom do you tell this? This is the way you, Azerbaijanis, are. We will get school leaving certificate and will mature. We will enter an institute, then we will do military service and become men, we will enter a party during the military service and get a position. Then we will come back and get a job. Then we will marry an aunt's daughter and get a baby…then one more baby…then another one…We will get them educated, raise and marry. We will live our life for others and then die. Did I say everything correctly, Ahmed jan?" "I don't know. Let's get home before it is daylight. Our clothes are in a terrible state. I wish our parents did not notice it". "Let them see it. Today I became happy. I love Ahmed jan". "Speak in a lower voice, for someone can hear us. Don't say anything at home yet. It will cause a stir. Ok?" "Ok, Ahmed jan. Let it be the way you want, for you have become a man and I…"
We received school leaving certificates. Shushanik submitted documents to the Agricultural Institute and I to the Oil and Chemistry Institute. Both of us became students. Again, we went to our lessons together. We stole each other from the lessons. After getting scholarship, we sometimes went to a café. No one knew our secret of the "Graduation Party". We were waiting for our graduation. When our parents went to a wedding or for a walk, we "studied our lessons" at her home. So, we lived happily. Every day after classes I went up Torgovaya Street to the Agricultural Institute. Shushanik was waiting for me in the street. Together, we took a walk around the city or went to a library. The same happened in the morning. Firstly, I accompanied her and then went to my lessons. Several years passed. We were in our 4th year. As always, I went to meet Shushanik. It was noisy on Communist Street. Someone was shouting "Resignation!," another one "Karabakh!" and "Damn you!" People were walking to Lenin Square carrying posters reading "Armenians, hands off Karabakh!" I came up to the institute. Shushanik was not in her usual place. I went in and saw her standing at the window facing Communist Street. She was trembling. – "You came, Ahmed jan. I am scared. Very scared." – "What are you frightened of? What have you done to be frightened?" – "I was happy today. I felt like the entire world belonged to me. But now I am scared. I fear to lose you". – "I am here and I am not going anywhere. Why didn't you wait for me in the street?" "For fear. The crowd was shouting, 'Rally! Rally!' and everyone took to the street. They were looking at me askew. But what have I done?" "Can you explain what has happened?" We swapped roles. Now it was I who was pestering Shushanik with questions. She replied she didn't know. I understood that there was something she knew. In her eyes, I read the answer to the question "Armenians, hands off Karabakh". "God is witness, Ahmed jan, it's not our fault. We have not done it." I did not enter the house. I went to Lenin Square. The cause was that the Armenians had cut down a tree in Topkhana forest. I was surprised. Topkhana and Baku are different places. Second, thousands of people took to the street because of three or four trees. All right, if they gathered, why didn't they march to Topkhana to stop the cutting down of trees? They are crying. Someone went up to the podium, as if controlling the crowd. "Sit down, stand up. Sit down, stand up". Now he is saying that "he who does not sit down is Armenian". Someone lingered and sat down later. He was kicked. What will happen to us? Later, I heard the words "Nagorno-Karabakh Autonomous Oblast". Then they spoke about professor Aghabekyan's interview to French Le Figaro. Historians and the intellectuals took the floor. During the rally, no one asked questions like Shushanik, Armenian woman. They were explaining. Then they said that the Armenians expelled the Azerbaijanis from their ancestral homes in Armenia. They even killed several people, boiled them alive in a chimney. They tied hot samovars to women's back. They disemboweled a pregnant woman and impaled the baby. They branded Armenian cross on her breast. The Karabakh Armenians demanded to separate NKAO from Azerbaijan and join it to Armenia. They held a referendum and voted "yes". What is it? Is it true? So, that was why Shushanik and her mother were worried. Does it mean they knew about it in advance? I returned home. I knocked at Shushanik's door. She opened the door cautiously. "There is no one at home except me and my mom. My dad and brother have gone to Hadrut. We are afraid even to go to buy bread". "Who offends you? What are you frightened of?" "We are scared because we are Armenian." "Don't go out. I will buy and bring everything you need." My father came home late in the evening. He was aware of what was taking place in the city. We were having supper when we heard a knock at the door. It was Shushanik. She did not come in. She whispered a few words into my ear in the corridor. I wished to fly. When my father and mother asked what had happened, I did not hide it anymore. "Dad, mom, you will soon become grandfather and grandmother. I and Shushanik have been coupled for a long time…"
My parents said nothing. They were dumbfounded. I was beyond myself with happiness. I wished to have a baby girl. Beautiful, clever and gifted like Shushanik. However, my parents' faces did not clear up. They did not know what to say. "What shall we do now, sonny?" "What to do? To ask her hand in marriage. Arrange an engagement and then wedding as it is the way". "Shall we take 'red apple' as well? While the city is in a chaos, you are going to ask in marriage an Armenian woman? Do you want us to be shot? What will our relatives say?" "How is that, mom? Yesterday you called Shushanik 'daughter, dear,' however, today you call her 'Armenian?' She grew up in front of your eyes. We have been together since childhood. We love each other. We will have a baby. Shushanik and I will go to registry office tomorrow morning. If you do not want to have a wedding, then don't have it". "The Armenians stir up trouble in Armenia and Karabakh, sonny, while you want to bring an Armenian daughter-in-law home?" "I will make her daughter-in-law and give her my surname. She will convert to our religion and nationality if necessary". After supper, my father went to the balcony to smoke and called me up. "The situation is escalating, sonny. I know that your honor would not allow you to leave your child without father. But I want to tell you a story. Once an Armenian named Vazgen said he wanted to become Muslim. He comes to mosque to talk to mullah. The mullah explains to him all rites and holidays. The Armenian diligently carries out all the instructions given by the mullah. He even performs a circumcision. The turn of the last ceremony comes. The mullah tells him to dig a grave near the mosque. The Armenian is wrapped in a white sheet and placed into a coffin. The mullah asks Vazgen which Islamic name he picked for himself. He replied 'Mammad.' The coffin with Vazgen is lowered into the grave three times and then taken out. Each time the mullah says, 'Vazgen is gone. Mammad came. Vazgen is gone. Mammad came. Vazgen is gone. Mammad came.' In the end he says, 'Now you are Muslim, Vazgen. Go and do what our religion requires.' Mammad does so. "One day he wants barbecue. The Armenians make barbecue from pork. However, Islam says that pork is haram. Mammad knew it and therefore he killed sheep and made barbecue. But he was not sated. Ten days later, he again made barbecue from mutton. But he could not forget the taste of pork. He thought long how to solve the problem and found a solution. He took a piglet, put it into a basket and lowered it into a grave three times. He repeated, 'The pig is gone. The sheep came.' He killed the pig and made barbecue. Don't forget this homily, sonny. No matter if he changes his name, surname or religion, an Armenian will be an Armenian. Now do as you like. It's up to you to make a decision". My father's words reminded me of the play Othello. Although I did not understand the story of Vazgen, a bad feeling remained in my heart. What will be the end of this … I don't know. Shushanik and I went to the registry office in the morning and submitted an application. She said she was taking my surname and was even going to change her name. I disagreed with her. "I like your name very much, Shushanik. I at once remember Shushi". "Ahmed, my name, Shushanik, was given by my father in honor of the wife of Ashot Syunetsi, prince of Syunik in 906. But I will change it to Syusan. Syusan Mammadova sounds well". A month passed. We got married formally. Shushanik changed her name to Syusan Mammadova. In her passport, she asked to indicate her nationality as Azerbaijani. Her father and brother came from Hadrut for two days. They registered me in their apartment, ended their registration and went back to Hadrut. Some of the neighbors even had tears in their eyes when they were leaving. Shushanik Armen Manucharyan kept living in her ancestral home, now as Syusan Mammadova. In her ancestral home registered in my, Azerbaijani's, name. Several months passed. Syusan converted to Islam. She started to wear hijab. She gave birth to our baby boy. Upon Syusan's wish, we named him in honor of one of the ancient Turkic tribes, Ermen. I did not know it before. She found it at a library, brought and proved it to me. I agreed. It was a new name. There is Turk Men. Now, let there be Er Men. My son was courageous and brave. In the times of national revival and rallies, it sounded fine. I was even praised for that name. In those days, Syusan helped all our Armenian neighbors. She hid them in our home in dangerous time. My wife, in hijab, told the refugees looking for vacant Armenian homes that she herself had just come from Karabakh, Shushi, and knew no one. Several years passed. Only one Armenian remained in our yard – Azerbaijani and Muslim Syusan Mammadova.Both my parents and I forgot about her Armenian descent. But I did not forget my father's words. Syusan behaved like a real Azerbaijani woman. Both of our sons, Ermeni and Erseni, grew up in Turkic spirit, like true Arranians. I got a promotion in my job. I made friends with my director. Our wives also became friends. Our children attended the same school. The name of my boss's wife was Garangush, but sometimes he confused it and called her Haykanush. Just like me. Sometimes I confused it and said Shushanik instead of Syusan. She immediately held my mouth. "Be quiet, the children can hear it." "Hi, Armen, welcome to Russia." I was taken aback. How could they know that my children are half-Armenian? "In your language it is Ermen – Ermeni, while in Russian and in Armenian it is Armen. Armenian, Great Armenia. Hi, Arsen." Then I got it that "hi" is a greeting in English. So, are the English hidden Armenians? I was embarrassed. Wherever I looked, I saw the imprint of the Armenians. Even the migration officer is Armenian. He immediately understood that Armen and Ersen are half-Armenian. I wondered how he knew that. Apparently, his blood surged up. They have one genetic code. They understand one another at once, even if they wear hijab. I bit my lip. Shushanik, converting from Armenian to Azerbaijani back in the 1980s, hiding under Turkic names, named our sons not Ermen and Ersen, but Armen – in honor of her father and Arsen – in honor of her brother. Not just in honor of her father. She gave him the name of a nation, a state. The name of her state created in the state of Azerbaijan. I wonder how many Ermens and Ersens live in this state, looking like their uncles by the mother's side. Do they deserve my hatred or pride? Do they bear the blood of their fathers or mothers? Which of them is their native tongue? Which of them is their homeland? When Shushanik asked me if I believed that an Azerbaijani man could love an Armenian woman I should have asked her if she believed that an Armenian woman could love an Azerbaijani man. I don't know whether or not she believed in that love, but I absolutely believed in her big, everlasting and great love for her nation, her people. Half-Turks and half-Armenians born to Shushaniks will be perceived in the same way all around the world. In Turkey, the worst enemy of the Armenians, they will be Ermen and Ersen, while in Russia, Baltic States, Ukraine, America and Armenia they will be Armen and Arsen. In any case, no matter if he is Ermen or Armen, there will be the notion of Ermeni, Ermenistan, Armenia, Armenian. Also, it was we, the Azerbaijanis, who gave them the name "Ermeni." We also gave them the ancient Turkic land, Ermenie, for them to create their own state in the Soviet Union. The words "Armenia" and "Armenian," in Russian and English, are also derived from that Turkic name. On the world map, to those who say that "I am Armenian and my homeland is Armenia" we always reply, "No, you are Ermeni. You are our enemy. You are the descendant of those who caused a lot of distress for us for centuries." Thus we made them ancient. We made them heroes of our literary works. We glorified the love of an Azerbaijani man for an Armenian woman. But we failed to show the fading of her love for an Azerbaijani man against the background of her great love for her nation. We, the Azerbaijanis, are ready to "call an Armenian our uncle" for our own hand. But how inoffensive and ridiculous is this compared with the woman who for the sake of her nation and future says to an Azerbaijani: "dear, my husband, I am a Turk," going to bed with him! The frontier guard is stamping my passport. I remembered how my father "stamped" my marriage with Shushanik. Not just remembered it. I understand it now. But it is too late. To forget my father's words, I dig a small grave in my heart. I repeat to myself three times, "Shushanik is gone. Syusan came. Shushanik is gone. Syusan came. Shushanik is gone. Syusan came."